President Donald Trump had been considering firing former FBI Director James Comey since he was elected, a White House spokeswoman says. Sarah Huckabee Sanders told media there had been an "erosion of confidence" in Mr Comey over the last year. The administration maintains he was removed on Tuesday for his handling of the Hillary Clinton emails inquiry. But US media report Mr Comey recently asked the Justice Department for more resources for his Trump-Russia inquiry. The US Senate Intelligence Committee has invited Mr Comey to testify next week. The White House is rejecting calls to appoint a special prosecutor to investigate allegations the Trump campaign colluded with the Kremlin in last year's US presidential election. "We don't think it's necessary," Ms Huckabee Sanders said on Wednesday. "No one wants this to be finished and completed more than us." 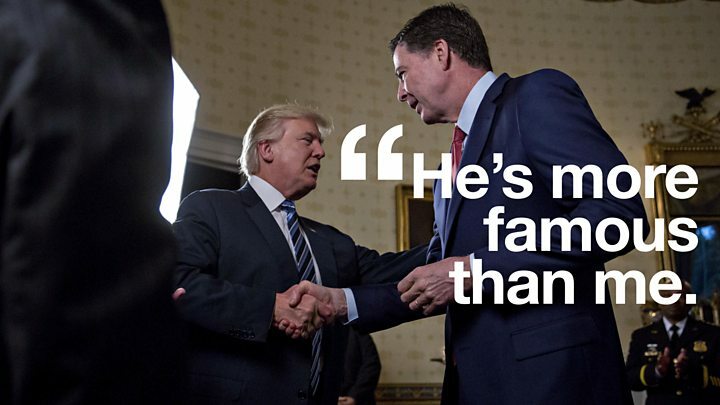 In a farewell letter to staff, Mr Comey wrote: "I have long believed that a President can fire an FBI Director for any reason, or for no reason at all. He signed off: "Working with you has been one of the great joys of my life. Thank you for that gift." 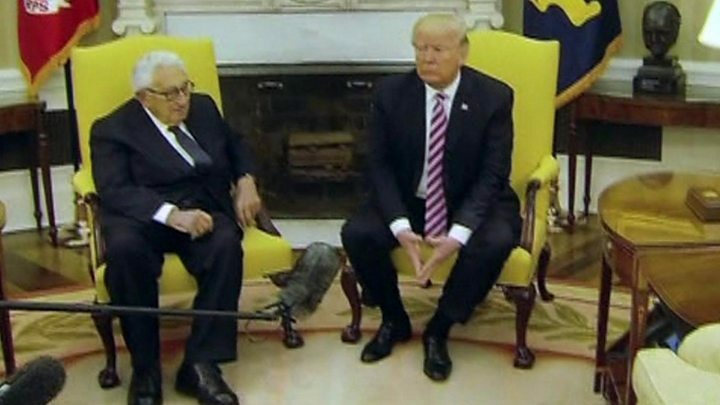 If Donald Trump is trying to avoid comparisons with Richard Nixon's scandal-plagued presidency, welcoming Henry Kissinger - the man probably most closely connected with the former president - in the Oval Office probably isn't the best move. The whole group meeting with Russian Ambassador Sergei Kislyak was a bit strange, starting with the fact that it happened at all. Given the allegations that Mr Trump fired James Comey because of the FBI investigation into Russia ties to the Trump campaign, meeting Moscow's envoy the very next day isn't exactly good optics, as they say. Neither is keeping US media out of the room and having Russian state photographers provide the only public images of the event - images that are sure to feature in Democratic campaign adverts in the not-too-distant future. During the campaign, Mr Trump famously joked that he could shoot somebody, and his supporters would stick by him. Smiling with the Russian ambassador in the midst of a growing Russian hacking controversy is the diplomatic equivalent - a brazen move sans firearms. Many in Washington will howl, but there's no guarantee it will move the needle among the president's legions. The White House insists it was because of how he handled the investigation into Mrs Clinton's use of private email while she was secretary of state. But many are sceptical that the FBI director would be fired because of actions that have been widely attributed for Mr Trump's shock election victory. The White House spokeswoman said Mr Comey had committed "atrocities, circumventing the chain of command" within the Justice Department. The White House said the "final catalyst" was Tuesday's letter from Deputy Attorney General Rod Rosenstein condemning Mr Comey's "serious mistakes". Mr Rosenstein faulted Mr Comey's decision last July to announce the Clinton emails case was closed, and for revealing in October - 11 days before the election - that the inquiry had reopened. The deputy attorney general said Mr Comey's conduct had "usurped" the then-attorney general. Unnamed White House officials briefed Reuters news agency that Mr Trump finally lost patience with the FBI director last week over a perceived act of insubordination. They said Mr Comey had refused to preview for top presidential aides his planned testimony to a 3 May Senate hearing on the Clinton email issue. Critics accuse the Republican president of firing the nation's top law enforcement official because he was leading an inquiry into whether the Trump campaign colluded with the Russians in last year's election. On Wednesday, Democratic senators Dianne Feinstein and Richard Durbin told US media that Mr Comey had asked the deputy attorney general for more resources - mainly staff - for the FBI investigation. Justice Department spokeswoman Sarah Isgur Flores called those reports "totally false". 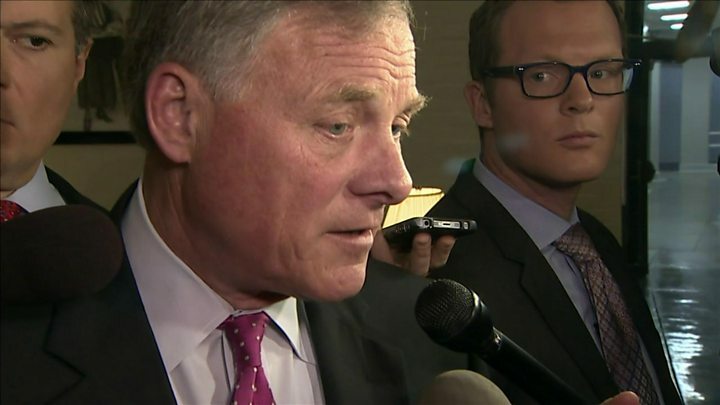 Either way, Republicans and Democrats vowed the House and Senate Intelligence Committees' investigations into the Russia claims would continue. Republican Senator Lindsey Graham said if Mr Trump believed replacing Mr Comey would halt the inquiries "he made a big mistake". What does President Trump say? The president stood by his actions on Wednesday during a surprise meeting with Nixon-era Secretary of State Henry Kissinger. Mr Trump said Mr Comey was fired "because he was not doing a good job". 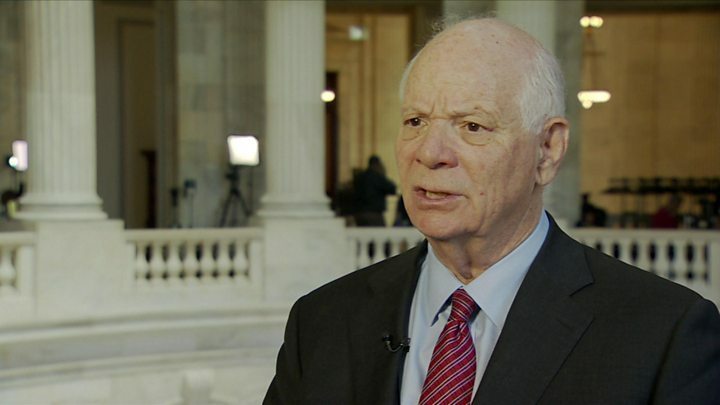 His remarks preceded a meeting with Russian Foreign Minister Sergei Lavrov and Russian Ambassador to the US Sergei Kislyak - his first with any Russian official since taking power. Mr Trump later tweeted: "Dems have been complaining for months & months about Dir. Comey. Now that he has been fired they PRETEND to be aggrieved. Phony hypocrites!"